Steven Radosevich is a professor and graduate program coordinator in the Department of Forest Science at OSU. His research interests focus on plant ecology, sustainable forestry and agriculture, and the impacts and ethics of human land uses. He grew up on a farm in Tieton, Washington, in the upper Yakima Valley. Pruning an orchard, he writes, means making choices. “Good wood” refers to tree limbs laid on the ground, a result of choices that lead to a productive orchard. In 1987, Franz Dolp found what he was looking for: a place where nature beckoned, about 40 acres of cutover forestland in the Oregon Coast Range along a quick running tributary to the Marys River. He felt inspired by the remaining moss-covered forest and a spring that emerged high on a mountainside. After buying the land, he built a wood cabin with tall ceilings and expansive windows. He planted more than 10,000 cedar, hemlock and fir seedlings. He loved this place and wanted it to inspire others. Dolp, an economist and poet, died in 2004. Before his death, he worked with Moore to create a program that carries out his vision for the cabin to serve as a retreat for writers and naturalists. Today, operating out of the Department of Philosophy under Moore’s direction, OSU’s Spring Creek Project for Ideas, Nature and the Written Word brings poets, writers and scientists together to explore our relationship with the natural world. The cabin on Shotpouch Creek hosts retreats, meetings and other Spring Creek events. Moore and her colleagues have taken their mission well beyond these mountains. Financed by a private donor, they have held gatherings and academic conferences in Corvallis and a public presentation attended by more than 1,800 people in Portland. With the U.S. Forest Service, they sponsor an annual poet’s retreat at the H.J. Andrews Experimental Forest east of Eugene. Moore and Associate Director Charles Goodrich regularly lecture or give readings in the Northwest and throughout the country. Their goal: philosophical clarity in our relationship to nature. “As a philosopher, I believe that ideas matter, that what people believe shapes the decisions they make,” says Moore. “The more cogent and clear-thinking their ideas, the wiser their decisions will be. On the other hand, confusion or disagreement about the fundamental ideas of a practice lead to incoherent policies or stalemate. Science blends with art and writing in Spring Creek’s Long-Term Ecological Reflections (LTER) project at the H.J. Andrews Experimental Forest. In 2004, Robert Michael Pyle, nature writer and scientist, served as the first LTER writer-in-residence. He focused on a 200-year-long log decomposition study. Few places provide as dramatic a focus for Spring Creek as Mount St. Helens. On a warm July evening in 2005, Moore, Goodrich and two-dozen poets, writers, scientists and artists circle around a campfire dug into loose pumice on a windswept ridge near the mountain. The deep carpet of popcorn-sized rock makes for uncertain footing. The mountain’s 1980 eruption had reshaped the landscape with no regard for trees, wildlife, people or even well-honed scientific theories. Research at the national monument has overturned theories of how nature responds to upheaval, and the Spring Creek group’s conversation often turns to scientific surprises. Ecologists describe biological diversity that blossomed unexpectedly after the eruption. They point to populations of western toads that are flourishing here while they are declining elsewhere. They tell of hot gases and rocks that turned Spirit Lake into a microbial stew resembling a pulp mill lagoon and how fish eventually returned. Geologists talk about the plumbing under the mountain and how often it has cracked and heaved in cycles of cataclysm. In the face of such power, there is also poetry and song. Folksinger Libby Roderick sings “Thinking Like a Mountain” and “If the World Were My Lover.” Goodrich reads a Denise Levertov poem, “Open Secret,” evoking the power of mountains as metaphors for human aspiration. They watch the full moon rise and roll up a neighboring slope. As moonlight strikes the valley floor behind them, a chorus of coyotes yips and howls. Nighthawks dip and climb overhead. Beautiful as the scene is, this is no sentimental journey. They are here to work. They trek through the “blast zone” where dark forests, once destroyed, have given way to a carnival of new life. They find pockets of sphagnum moss, Indian paintbrush and penstamen, some of the “biological legacies” that survived the blast, paving the way for diversity by seeding the new landscape. They visit forests that had been left standing after layers of volcanic ash had covered every leaf and branch. They discuss the differences between human-caused and natural catastrophe — and the meaning of recovery. The point is to think hard and deep about nature’s resilience in the face of destruction and to reconsider the ideas that define the role of humans in these natural processes. At the end of three days, they give a public presentation at the Windy Ridge Visitor’s Center. Mount St. Helens’ steaming crater, which geologists say could rebuild the collapsed mountain in as little as nine years, broods over the deliberations. Moore, Goodrich and their colleagues bring diverse academic and literary expertise to the task. Moore has a Ph.D. in the philosophy of law. 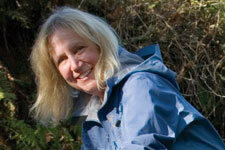 She has written seven books, including three compilations of essays exploring the cultural values of wet, wild places. That has not always been her focus. Her first book, published in 1989, explores the moral justification for presidential pardons. Since then, she has won a Pacific Northwest Bookseller’s Award for Riverwalking (1995) and the Sigurd Olson Nature Writing Award for Holdfast (1999). In 2005, she won the Oregon Book Award for The Pine Island Paradox. In addition to several volumes of poetry, Goodrich has written a book of essays (The Practice of Home) and edited two anthologies of poems. In 2004, Russell spent two days at the Shotpouch cabin with a small group of OSU students and faculty. Their topic: science and art as sources of knowledge and ways to communicate in a sustainable society. “This didn’t fall into the typical training of scientists like myself. Yet truly cross-disciplinary discussions about what leads people to care and pay attention to their environment are fundamental if we hope to move toward a more sustainable future,” he says. Toward that end, Spring Creek fosters storytelling. Told through poetry, song or scientific report, stories evoke common human values that link people across barriers of culture, politics or religion, say Moore and Goodrich. “On a practical level, it is the most powerful way to bridge different viewpoints, to meet people face-to-face and hear their stories. You can’t abstract people into a single position,” says Goodrich. “Stories reveal the whole of a life. “We’re just getting started,” says Moore. Future Spring Creek programs will focus on ideas related to land ownership, the commons and watershed health. With the Forest Service, Spring Creek sponsors the Long-Term Ecological Reflections project at the H.J. Andrews Experimental Forest. The plan is to bring writers and poets to the forest annually for a week at a time for the next 200 years. The resulting record of creative responses to the forest will help us to understand what forests mean in the human experience. “Imagine if we had started this project 200 years ago, with Lewis and Clark, what we would know about the changing human response to the land?” Moore says.